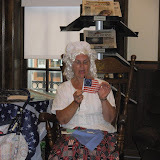 Boscobel Public Library: Spring Events Lead to Summer Library Programs! Spring Events Lead to Summer Library Programs! Join us in May for "Get Caught Reading Month" and "Turn Off Your Screens" week. May is Get Caught Reading Month". Snap a photo or draw a picture of yourself or friend's reading and bring it to the library. We'll add your images to our "Caught Reading" bulletin board, where everyone can vote for their favorite. Whoever get the most votes wins an Amazon.com giftcard, good for the purchase of their favorite new book! Bring the whole family to the library on May 2nd at 3:30 pm for an entertaining and educational "Summer Safety Fun" program, featuring special guest, Boscobel's Assistant Chief of Police, Kevin Copus. Hear the chief read a story and learn all about biking, swimming, street and playground safety to help you enjoy an "owie" free summer vacation. The library's Spring movie night series wraps up this month on World Cinema Day, Thursday, April 19th at 6:30 PM with Hugo, a 3-D family friendly adventure based on the Carnegie prize-winning children's novel, The Invention of Hugo Cabret by Brian Selznick. Hugo has been called a love letter to the history of cinema, an "exquisite fantasy" that invites its audience to "Come and dream with me". The film is ostensibly a child’s adventure about a young orphan called Hugo (Asa Butterfield, from The Boy With Striped Pyjamas) struggling to survive within a French railway station, where he’s been dragged as child labor by his uncle (Ray Winstone) after the untimely death of Hugo’s dad (Jude Law). Hugo lives and works inside the station's huge clocks while he struggles to avoid discovery and decode the mystery of an automatic writing machine, "automaton", that he believes will reveal a secret message from his dead father. The secret Hugo discovers with the help of a girl who befriends him(Chloe Grace Moretz) and her mysterious uncle (Sir. Ben Kingsley) is one that changes everyone's life and leads Hugo finally to a safe and loving place. Hugo has a magic that’s rare in modern movies and is "easily the most gorgeous live-action movie ever made in 3D". Bring the whole family and join us at the library on April 19th for a thrilling journey that critics are calling "the stuff that dreams are made of". Hugo, 120 minutes, rated PG. This event is open to the public and free of charge. Nice blog to reading thanks for sharing such useful information this is very helpful for students who learn online and want Assignment Help Online.And keep continue to sharing useful information for us.